An Inspector General of Police, serving with the CRPF in the North East, has raised several questions regarding an encounter carried out in a joint operation by the Army, Assam Police, CRPF and the Sashastra Seema Bal (SSB) in Chirang district of Assam in the early hours of March 30 this year. In his report sent to CRPF headquarters in Delhi, Gujarat cadre IPS officer Rajnish Rai, currently posted in Shillong with CRPF as IG, North East Sector, has alleged that the encounter — neat Simlaguri village under Amguri police station — that led to the death of two suspected members of the National Democratic Front of Bodoland (Songbijit), or NDFB(S) faction, was staged. And that the two men were picked up from a house in D-Kalling village and killed in cold blood in Simlaguri. Calling for a full-fledged investigation, Rai has alleged that weapons were planted on their bodies. The two killed were identified as Lucas Narzary alias N Langfa and David Islary alias Dayud. He says he has witnesses who have identified the bodies as those of the two men who were picked up and that these witnesses are in his safe custody. 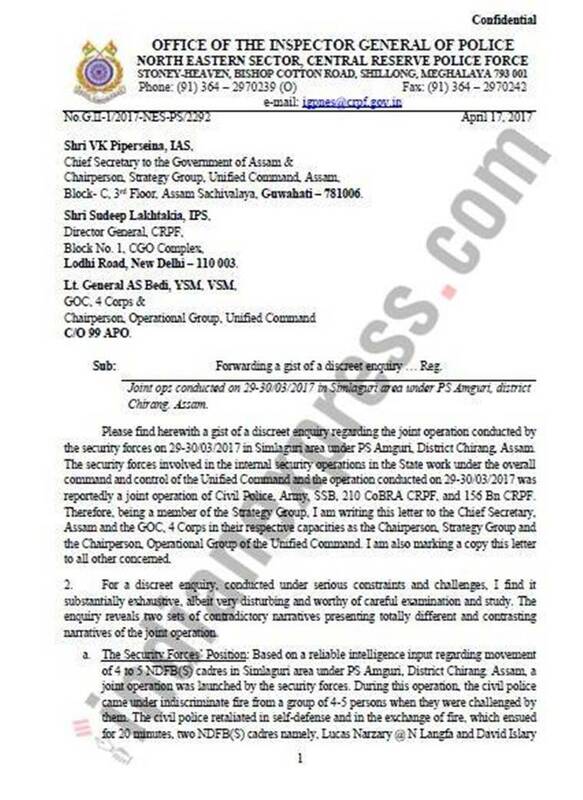 Rai’s report, dated April 17, 2017, is marked to Assam Chief Secretary V K Pipersenia; the then acting CRPF DG Sudeep Lakhtakia; Lt Gen A S Bedi, GOC, 4 Corps & Chairperson, Operational Group, Unified Command; Assam DG Mukesh Sahay; SSB DG Archana Ramasundaram and CRPF ADG (NE Zone) Mohd Javed Akhtar. * GPS records show how a CRPF unit of the CoBRA visited the encounter spot in Simlaguri a few hours before the encounter. “It leads to the suspicion that the CoBRA (CCCC) team was trying to identify a suitable location where the alleged encounter with the NDFB(S) cadres could be stage managed,” Rai’s report says. It refers to “discreet” enquiries by senior officers who contradict the official version of the events. * It cites statements of witnesses who have identified the photograph of the two slain cadres as the men picked up from D-Kalling village on the night of the encounter. Rai has not attached their statements to protect the identity of the witnesses but claims they would be presented to an independent investigation team. * An 11-year-old boy was present in the house from where the suspected NDFB(S) men were picked up. This boy, says the report, was taken away by a woman who lived in the adjacent house even as the operation was on. * As per the Special Situation Report prepared by those involved in the operation, Team No. 15 of 210 CoBRA was involved in the operation. However, when the enquiry officer asked some of the men from the team, they flatly refused being part of it. The report says this shows there was something amiss as the same men were earlier taking credit for the operation. 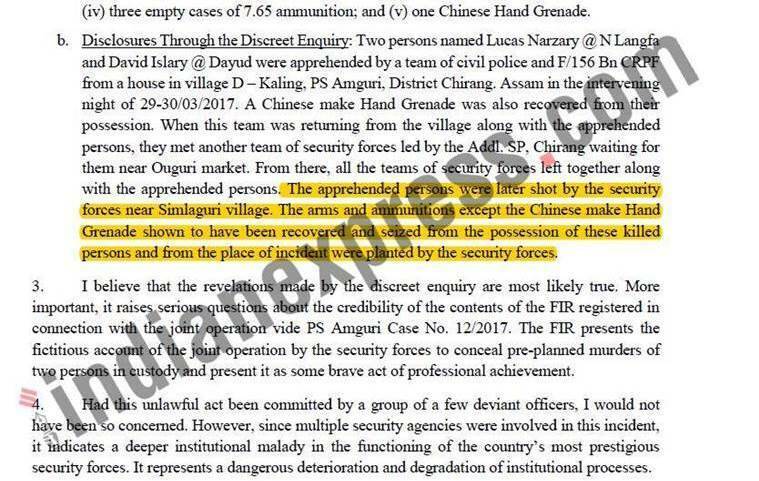 * The report suggests that a team (of Assam police and Army) picked up the NDFB(S) cadres from D-Kalling village and then met another team at Ouguri. It was then that the decision to kill the duo was taken. 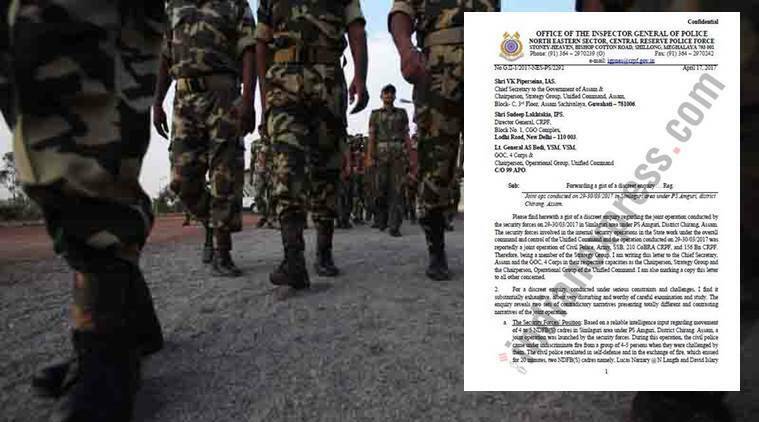 On May 22, The Indian Express sent an email to the spokespersons of both the Army and the SSB for their comments on Rai’s report. Neither responded. Assam Chief Secretary did not respond to repeated calls and text messages over two days. CRPF DG RR Bhatnagar said he would wait for Assam Police to complete its probe. “The report has already been sent to Assam police. It is their prerogative to investigate the matter. If their investigation finds anything wrong with the encounter, appropriate action will be taken,” he said. Security personnel claimed to have recovered one 5.56 mm INSAS rifle along with magazine and twon live rounds 5.56 ammunition, nine empty cases of 5.56 ammunition, one 7.65 mm revolver along with three rounds of 7.65 ammunition, three empty cases of 7.65 ammunition and one Chinese hand grenade from their bodies.